Engineers from the University of Sheffield's Advanced Manufacturing Research Centre (AMRC) with Boeing are using digital measuring techniques to help archaeologists preserve historically important sites from the Middle Ages. Based on the Advanced Manufacturing Park (AMP) in Rotherham, the AMRC is a world class centre for advanced machining and materials research for aerospace and other high-value manufacturing sectors. Metrology engineers Adam Wiles and Tom Hodgson have scanned one of only two medieval ossuaries left in the country for the Rothwell Charnel Chapel and Ossuary Project, run by Sheffield University’s Department of Archaeology. Ossuaries are vaults or chambers that contain human skeletal remains. It was thought that, in Medieval times, they were used to store bones removed from graves, which were then re-used. However, researchers now believe they were also centres of pilgrimage and commemoration. The team have used a Leica ScanStation P20 laser radar to capture the interior of the ossuary based at Rothwell Holy Trinity Church in Northamptonshire. Spinning 360 degrees on a tripod, the radar captures single points on the surfaces it scans. It is moved to multiple locations to capture as many points as possible. "The method is a very quick way of gathering a lot of data, which will be built up into a 3D image or virtual reality model of the inside of the ossuary," said Tom Hodgson. "As ossuaries are usually within the catacombs of a church, the number of positions we had to move around the scanning equipment was limited. The challenge for the team was how we gathered data in a limited environment, without it hampering the quality of the final models." Virtual reality models rendered by the AMRC are usually to create factory layout simulations, so companies can optimise their manufacturing processes. Using metrology to preserve data is a new venture for the AMRC. The team hope that if the project has merit as a standard method for preserving sites of historical interest, that it will create an increasing demand for use of the technology outside the manufacturing sector. 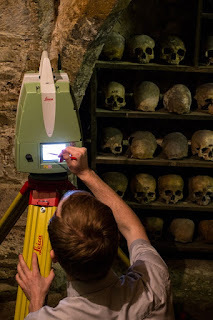 Tom added: "The metrology data we produce will be a crucial element to the Rothwell Charnel Chapel and Ossuary Project. As the site degrades over time they may want to limit access to the general public to help preserve the artefacts." Jennifer Crangle, doctoral eesearcher from the Department of Archaeology and the Rothwell Charnel Chapel and Ossuary Project team, said "As the stacks of bones will continue to degrade, the mass of the bones in future years can be compared to the scanning record, allowing us to document any changes over time. "Rendering the data into a virtual reality model creates a permanent record of a unique site, allowing researchers and visitors to see the entirety of the exact crypt structure, as it has never been seen before."